It never fails. Nature opens us up. As light snow steadily falls on a soft Sunday morning, a run on the trail into the woods turns into a delightful excursion off trail. As the girls open it up and break their own fresh trail. Our thoughts bind and limit us. Quiet, gentle nature frees us to think new things, see the world as it is meant to be. Wide open spaces ready to be explored and discovered anew. Inviting us to break trail. When the noise of civilization returns, return to that open space within, to your true self. That still, steady quiet voice within, that place of ease that needs no explanation. Time to break some trail. I got away to a friend’s cabin (house actually) for a few days. Relaxing, spending time together, playing several Scrabble games (still my favorite game). The world slows down between Christmas and the new year inviting us to slow down as well. And in the quiet unstructured time, we can actually hear that still small voice calling us to go deeper, observe what is present and be refreshed and renewed. While it’s easier to rediscover our thoughts and dreams in down time, we can carry that quiet within as we enter in to a new year with a clean slate. And we are offered a clean slate, a fresh start every day. The lessons we learn in quiet are meant to be carried back into ordinary daily living, making it less chaotic and more meaningful. 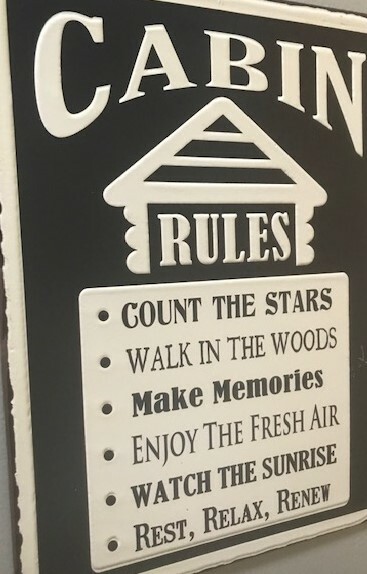 “Cabin Rules” should be our daily rules so we have that get-away vacation feeling every day. It is offered to us all if we dare slow down daily to see our blessings, be grateful and offer each day our best. Happy New Year and may the resolutions on your heart be reality in March. Keep that new, resolved feeling beyond the next few weeks. Cabin rules rule. 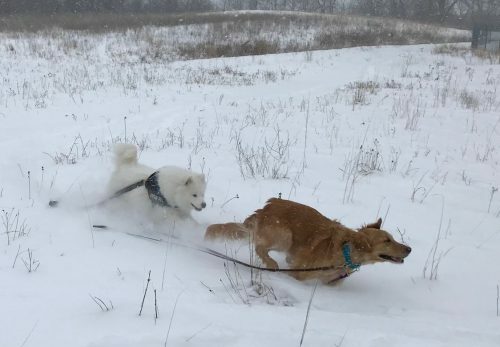 There is plenty of life to be found in winter. In rest, reflection and in getting out into the middle of it to discovery its own special beauty. Winter is not meant for hibernation alone. Its gifts are preparation, silence and transformation. Winter does the work so spring can get the praise. Never succumb to the “dead” of winter. Be open to life that winter offers in frozen ground, preparing the bud for bloom in due time. Daily gratitude, in each season. In the past few weeks, we’ve had unseasonably warm temperatures so all of the November snow has melted. 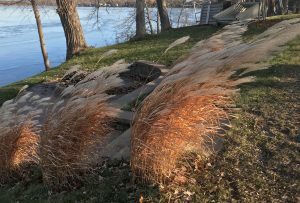 This week, the weather people have been showing off all of their computer weather models and predicting with confidence and certainty that we will have a “brown” Christmas which apparently happens 70 percent of the time. Lots of pining and consternation amidst the hurry and hustle of what is meant to be a season of reflection, anticipation and joy. 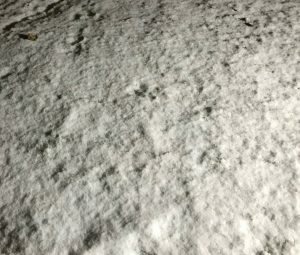 When letting the dogs out this morning, I was surprised by a beautiful fresh coat of snow, laying quietly on the ground. And, yet again, God enters softly and says something much different than our chatter. Reminding us for the 499th time (only an estimate, probably higher, should check a computer model to be sure) of who’s really driving. And if we would let go of the wheel that we are gripping oh so tightly, we might enjoy the ride. On this eve of Christmas eve and in every ordinary day, God is present waiting patiently to be found by us. And when we are spinning like a top going nowhere, He whispers with a fresh coat of snow making the world and all in it new again. He has already claimed us unconditionally. And when we stop putting conditions, rules and judgment on our life, we come alive. So with moments to spare, what God says has the final say. As it should. Merry White Christmas. Change the stories that don’t serve you well. Release yourself from perfection, rules and regret. Write a new page, a different ending. Give yourself and others a break, be a sucker and believe the best. Be kind and awake in the moment. Create a mosaic from the pieces and see the whole imperfect, beautiful mess. Be present to it all. Author of your life? – You. Bending and not breaking. That’s what we are made of. To flex, to move, to flow, to dance. When we stop fighting change and move into it, we find our strength. There is magic in the mystery of not knowing everything and allowing life to unfold. Set your sails. Too much of our precious and finite time is spent chirping – gossiping, being offended, yipping about the weather (too cold, too hot), offering judgment before compassion and the bigger winner – complaining. Thanksgiving should be the culmination of a year spent in gratitude. As you enter this week and the holiday season that ensues, take time each day to quietly reflect on the many gifts that you have been given as well as those that you have to offer. We are bigger than we allow ourselves to be. Let wonder back in by opening your eyes to daily blessings. Life is found hidden in moments. 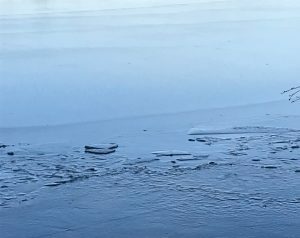 This year, we took the shortcut to January in Minnesota. Single degree temps and windchill. We know winter is coming every year and yet somehow are surprised when it arrives. Rather than run from it, run right into the middle of it. 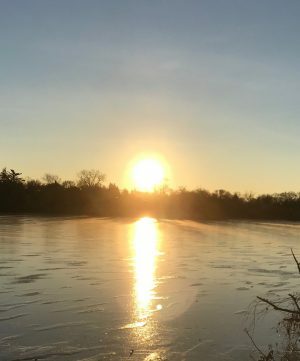 Discover the gifts that even winter has to offer like a stunning sunrise on a newly frozen lake before a 3-mile run. 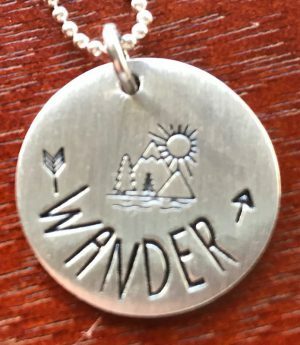 Just one more thing that I ask for – a grateful heart filled with awe, curiosity and wonder. Embrace Thanksgiving this week and the days to follow with an open heart and mind and a loving spirit. Gratitude brings the world to light and light to the world. Joy is a job. It takes effort, rigor, repetition and practice to get good at it. We look for the shortcut and expect it to be innate. But often, it’s not. So rather that succumbing to the negativity, gossip and cynicism, get to work. Focus on being grateful, even when the struggle is so very real. Lift your head and open your eyes a bit wider to see the beauty that is within reach right now. Ignore those voices in your head that serve no purpose but to prevent you from becoming you, the real one. 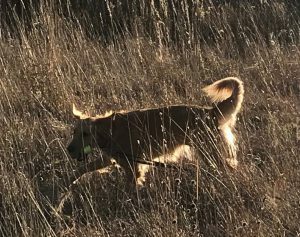 When I forget and get distracted by the minutia, I simply take the girls for a run into the woods and let them run off leash in the open field to pounce, chase and explore. It works every, single time. Make joy a priority and let it take root. Welcome it home like a long lost friend. And by all means, share it with others. Joy is a job and the most important one that you will ever have. Hunt, pounce, chase, explore and sniff it out daily. When joy is your job, life becomes less work.